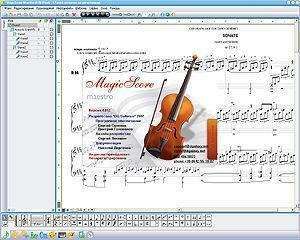 MagicScore is simply amazing music notation software! Its stunning interface and comprehensive features make it the smart choice for: musicians, composers, performers, teachers, students, choirs, ensembles, song writers, music lovers, music schools, music professionals, music innovators and trailblazers. MagicScore School is specialized notation software for music aficionados, students, teachers, schools and colleges. The program offers people interested in music a variety of notation options input, editing, printing, correctness check and much more. MagicScore School 4.196 is a shareware program and can be used as a demo to try the software until the free trial period has ended. A full version of the program is available after the trial period ends. For security reasons, you should also check out the MagicScore School download at LO4D.com which includes virus and malware tests. Additional screenshots of this application download may be available, too.